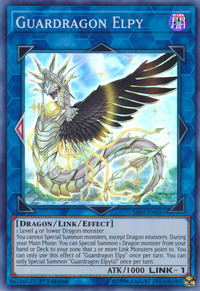 You cannot Special Summon monsters, except Dragon monsters. 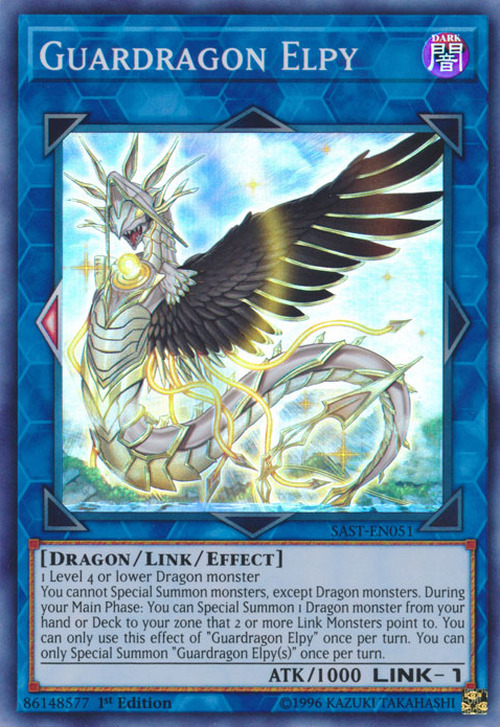 During your Main Phase: You can Special Summon 1 Dragon monster from your hand or Deck to your zone that 2 or more Link Monsters point to. You can only use this effect of “Guardragon Elpy” once per turn. You can only Special Summon “Guardragon Elpy(s)” once per turn. This monster's name is based on Elpis, the ancient Greek personification of Hope. Elpis was one of the evils stored in Pandora's box in the story. Hope was viewed as a negative emotion, prolonging the suffering of mankind, as opposed to the positive views held by more recent cultures.